Mowat-Wilson syndrome, or MOWS, is a genetic condition that causes a variety of disabilities and medical problems. One of the more distinctive problems in MOWS is Hirschsprung disease, a condition in which nerves are missing from muscles that control the large intestine. The lack of nerves means that the body has no way to send signals to the affected part of the intestine, meaning that it cannot function, and chronic constipation results. Because of this problem, MOWS is classified as a member of a group of diseases called a group of Hirschsprung disease-associated conditions. Other members of this group include Down syndrome, Waardenburg syndrome, multiple endocrine neoplasia type 2 (MEN2A), Goldberg-Shprintzen syndrome, and several others (reviewed in reference 1). MOWS is also called Hirschsprung disease-intellectual disability syndrome. The first cases of MOWS were only recently described, with the first case reports published in 1998 (2). It is likely that the disease existed long before then, but was simply not recognized. MOWS is a rare disease. At this time, there is little information about how many people are born with MOWS each year (incidence) or how many people have it at a given time (prevalence). One study in Japan estimated that prevalence there is roughly 1 person in 90,000 (3). Another study made estimates from figures for Hirschprung disease and estimated an overall prevalence of 1 person in 50,000 to 70,000 (4). More boys have been diagnosed with MOWS than girls (5). For example, in our literature review, 54% of 322 patients were male and 46% were female. This difference may be due to the fact that Hirschprung's disease is more common in boys, which may make the condition more likely to be diagnosed. MOWS affects many body systems. Patients tend to have global developmental delays (low intelligence as well as delayed development of motor skills, delayed development of speech, and/or delayed development of social skills). They can also have problems in the cardiac, musculoskeletal, genitourinary, and central nervous systems, in addition to the gastrointestinal tract. Half of the patients in our literature survey had short stature and 75% had very small heads (microcephaly). In spite of this fact, however, a large majority of infants with MOWS are of normal size at birth. In our literature survey, birthweight was normal in 88% of infants. Pregnancy is also typically normal. Hirschprung disease is often discovered within days or weeks of birth. Its presence can indicate that a child may have a syndrome or another condition. Heart disease, kidney abnormalities, and abnormalities of brain anatomy are also early warning signs that a larger problem may be present. These abnomalmities may be detected before birth on an ultrasound. Other early signs include the appearance of developmental delays/failure to meet milestones. For example, infants may not be able to hold their heads up or sit up when expected. This delay is due to low muscle tone (floppiness). In addition, most people with MOWS don't learn to speak meaningfully, with most being able to say 0 to ~10 words. Some patients also don't learn to walk, with those that do learning late to very late (i.e., at ages 2 to 4	or later). Most patients tend to be happy and/or affectionate. The most common signs and symptoms of MOWS are listed below. Hirschsprung disease (HD) is considered to be a hallmark feature of MOWS. However, in our literature review, just over half of 220 people with MOWS also had HD. Thus, even though HD is a hallmark feature of MOWS, its absence should not be used to rule out the diagnosis. Constipation with or without HD was much more common, being present in almost three quarters of patients. People with MOWS also have a similar facial appearance. The traits listed below reportedly occur in 95% or more of patients (2). The boy pictured at the top of the page has a typical MOWS appearance. Most facial features can become more obvious with time. 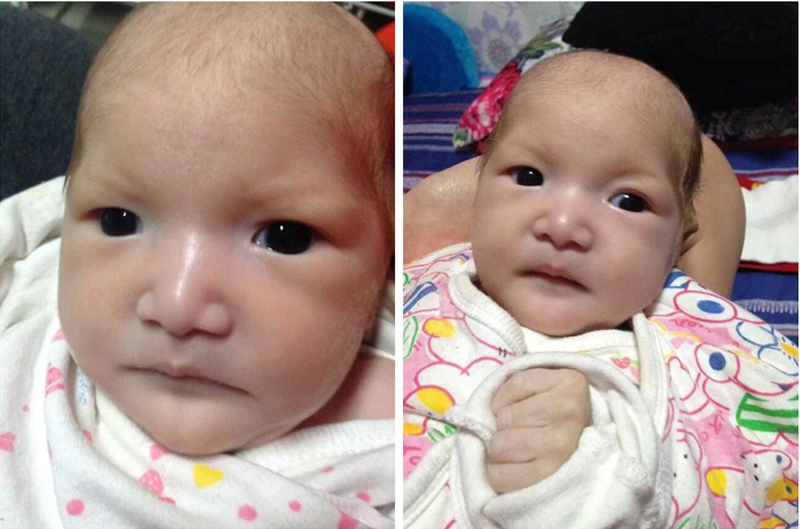 The facial features of MOWS are usually present in infancy, with the exception of the eyebrow pattern, which does not generally appear until after age 1 (6). Infants and young children tend to have squared and/or wide faces with deep-set eyes. Their chins may look pointed or otherwise prominent, a feature the becomes more obvious with time. Their jaws may also jut forward as time passes (see photos on this page; 5). The columella of their noses (the flesh that divides the nostrils) often hangs below the nostrils (see photos). The two most telling facial features of MOWS are the earlobes and the eyebrows. People with MOWS have uplifted earlobes that may have a depression in the center. 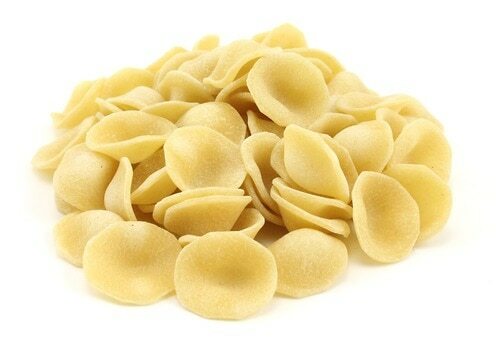 Many people commonly say that this depression makes their lobes resemble orecchiette pasta, though it is not as obvious on ears as it is in the pasta. With time, this depression becomes less obvious, but the lobes stay uplifted. 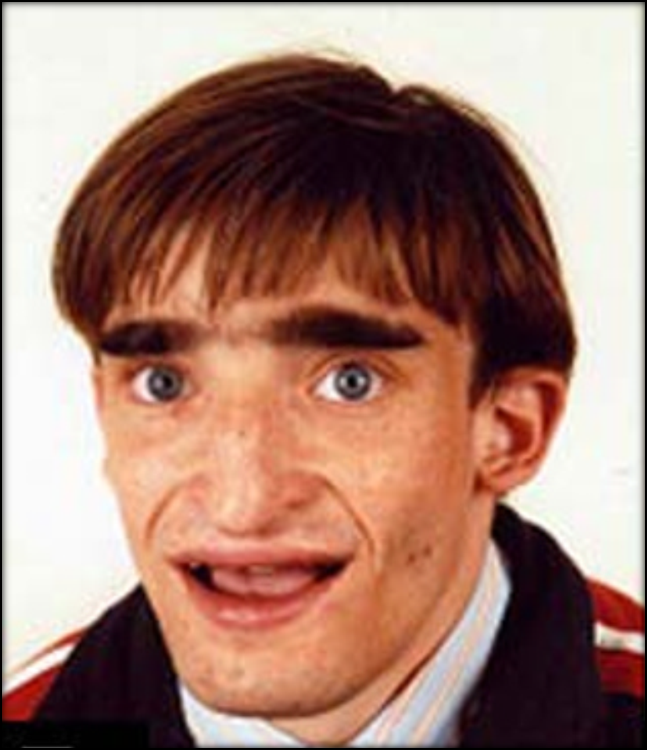 People with MOWS have distinctive eyebrows that develop after infancy. Their brows are thick near the nasal bridge and become sparser as they move outward on the forehead (see photos). As time passes, they may become thicker and wider. There is no cure for MOWS. Treatment is aimed at Hirschprung disease, controlling seizures, and managing other medical problems that can happen in MOWS. Surgery is the standard treatment for HD and some heart defects. In many patients, the abnormal section of the large intestine is removed, leaving only healthy intestine. However, if a patient has extensive loss of nerves, a transplant may be necessary. Only a surgeon can know what is required. Seizures can occur infancy or later, and can usually be controlled with standard anticonvulsants (5). However, they may be difficult to treat in a small number of patients. They may also eventually stop occurring in some people (6). Overall, the best approach to managing MOWS is to consult clinicians who are specialists in each type of problem that a patient has. MOWS is an autosomal dominant disorder caused by mutations in the gene ZEB2 (reviewed in 5). The term autosomal dominant means that the disorder occurs when one copy of a mutated gene is present. Autosomal dominant disorders are often passed from one parent to a child. However, MOWS is different. Most mutations in ZEB2 occur spontaneously when an individual egg or sperm is formed --- they affect only the child and the parents have no symptoms of MOWS. This means that the risk that parents will have a second child with MOWS is usually very low. However, in very rare cases, MOWS can be passed from a parent to a child when a condition called mosaicism is present. This term means that one of the parents has a mixture of cells with and without ZEB2 mutations. The parent may have very subtle signs of MOWS, but his or her normal cells can compensate and the full syndrome is not present. For example, in one case, a father had a mixture of mutations in cells throughout his body (7). He did not have MOWS, but he did have a few signs of MOWS, including short stature and uplifted earlobes. In another case, one parent had germline mutations --- meaning that only eggs or sperm are affected (8). In this case, both parents were healthy and had no signs of MOWS, but their chances of having another child with MOWS were high. Apart from these rare cases, mutations causing MOWS usually occur sporadically --- meaning that they happened for unknown reasons in an egg or a sperm. In addition, MOWS has been found in diverse racial and ethnic groups (9). Given that mutations happen sporadically, this situation is not surprising. The link at the right provides information about labs that test for mutations in ZEB2. The protein made by ZEB2 has an important role in the development of the nervous system and several organs. It is a transcription factor, meaning that it helps control activity of other genes. Its wide-reaching role helps explain why so many different organ systems are affected in MOWS. ZEB2 also has an important role in the formation of the enteric nervous system, which governs the gastrointestinal system. Again, this fact helps explain why people with MOWS have Hirschprung disease, which is caused by the absence of nerve cells in part of the colon. Although format criteria for diagnosing MOWS do not exist, a recent article has created guidelines that can help in that regard (10). The guidelines are reproduced below and are discussed in reference 10. Angelman syndrome (AS). AS is closely similar to MOWS. For example, people with both syndromes do not develop spoken language skills, have severe intellectual disability, and a happy personality. They may also have seizures, an ataxic gait, and microcephaly/a small head. One difference between them is that people with AS do not have the facial features seen in MOWS, especially the features of the eyebrows and earlobes. These features can help distinguish the two syndromes, but genetic testing is the only way to be completely certain of the diagnosis. AS is caused by abnormalities in the gene UBE3A. Rett Syndrome (RS). RS is another neurodevelopmental disorder with signs that are very similar to MOWS. Patients with both disorders do not have language skills and show stereotypy (repetitive movements). One key point about RS is that patients are almost always girls. Most boys with RS die before birth or in infancy; a very few survive until adulthood. Thus, being male does not rule RS out, but it is a strong indication that the patient does not have RS. A key difference between RS and MOWS is loss of purposeful hand use in RS. This term means that children with RS lose the ability to use their hands for purposeful tasks, such as playing with toys, pointing, reaching for objects and holding them, self-feeding, etc. People with MOWS may have impairments in hand use, but unlike RS patients, they know how to use their hands. In addition, RS patients typically acquire motor and language skills in very early life. The disease takes these skills away. MOWS patients may gain minimal language skills, but they do not lose them in the way that RS patients do. RS is caused by mutations in the gene MECP2, and sequencing can distinguish between it and PTHS. Hirschsprung disease caused by other syndromes. As noted in the introduction to this section, HD occurs in a number of other syndromes. For a list of syndromes and brief descriptions, consult the GeneReviews article on Hirschsprung disease. The list is long. In distinguishing MOWS from other syndromes that cause HD, it is important to look at facial and other features of the condition. Other conditions in the differential diagnosis for MOWS are described in the GeneReviews link on the right under More Information (also reference 10). 1. Moore SW (2012) Chromosomal and related Mendelian syndromes associated with Hirschsprung's disease. Pediatr Surg Int 28(11):1045-1058. Abstract on PubMed. 2. Mowat DR et al. 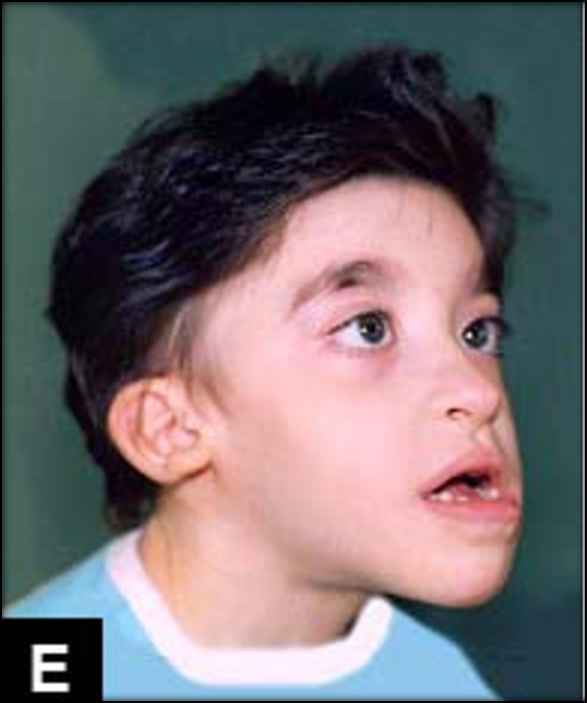 (1998) Hirschsprung disease, microcephaly, mental retardation, and characteristic facial features: delineation of a new syndrome and identification of a locus at chromosome 2q22-q23. J Med Genet 35(8):617-623. Full text on PubMed. 3. Yamada Y et al. (2014) The spectrum of ZEB2 mutations causing the Mowat-Wilson syndrome in Japanese populations. Am J Med Genet A 164A(8):1899-1908. Abstract on PubMed. 4. Mowat D & Wilson M (2010) Mowat-Wilson Syndrome. In Management of Genetic Syndromes 3rd edition:517-527. Partial text on Google Books. 5. Garavelli L & Mainardi PC (2007) Mowat-Wilson syndrome. Orphanet J Rare Dis 2 42. doi: 10.1186/1750-1172-2-42. Full text on PubMed. 6. Adam MP et al (2006) Clinical features and management issues in Mowat-Wilson syndrome. Am J Med Genet A 140(24):2730-2741. Abstract on PubMed. 7. Zweier C et al. (2005) Clinical and mutational spectrum of Mowat-Wilson syndrome. Eur J Med Genet 48(2):97-111. Abstract on PubMed. 8. McGaughran J et al. (2008) Recurrence of Mowat-Wilson syndrome in siblings with the same proven mutation. Am J Med Genet A 137A(3):302-304. Abstract on PubMed. 9. Dastot-Le Moal F (2007) ZFHX1B mutations in patients with Mowat-Wilson syndrome. Hum Mutat 28(4):313-321. Abstract on PubMed. 10. Adam M et al. 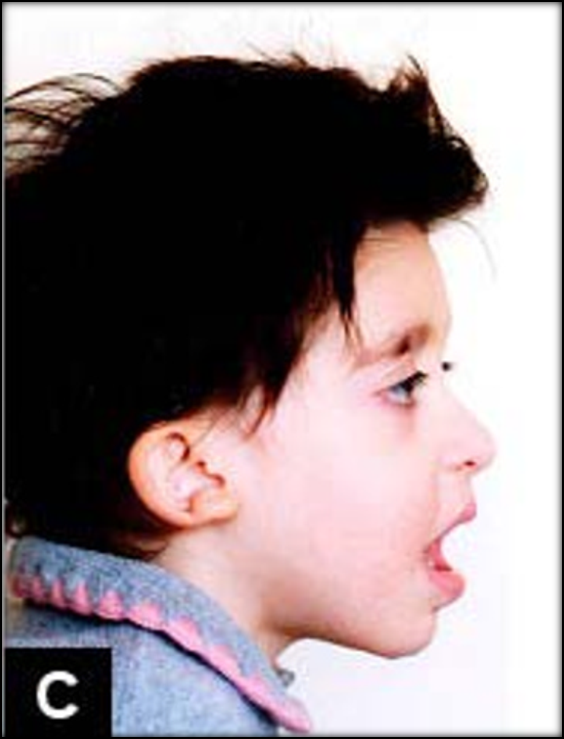 (2007) Mowat-Wilson Syndrome. Updated November 26, 2013. GeneReviews [Internet] Pagon RA et al., editors. Seattle (WA): University of Washington, Seattle; 1993-2019. Full text. 11. Mundhofir FE et al. 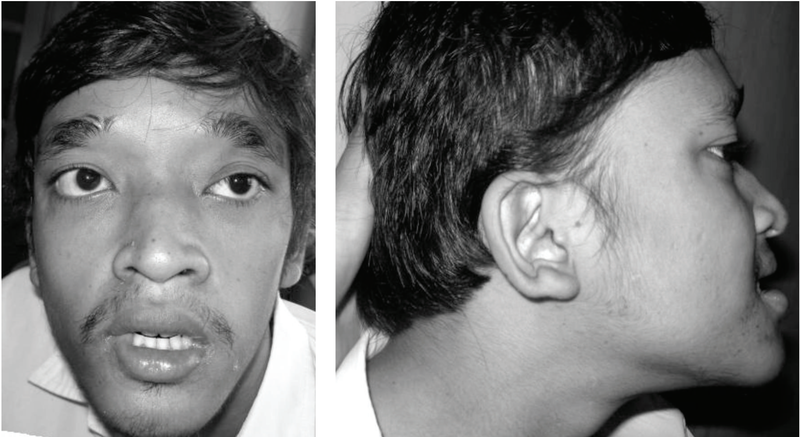 (2012) Mowat-Wilson syndrome: the first clinical and molecular report of an Indonesian patient. Case Rep Genet 2012:949507. doi: 10.1155/2012/949507. Full text on PubMed. 12. Jiang Q et al. (2016) Mowat-Wilson syndrome: clinical and molecular report of the frst case in mainland China. Int J Clin Exp Pathol 9(2):1195-1203. Full text from Publisher. Above: Wide-set eyes, distinctive eyebrows, and epicanthal folds in MOWS (5). Above: A girl with MOWS at age 3 years and 5 months. Below: The same girl at age 8. Her chin juts forward. pointed chin that jutted forward. 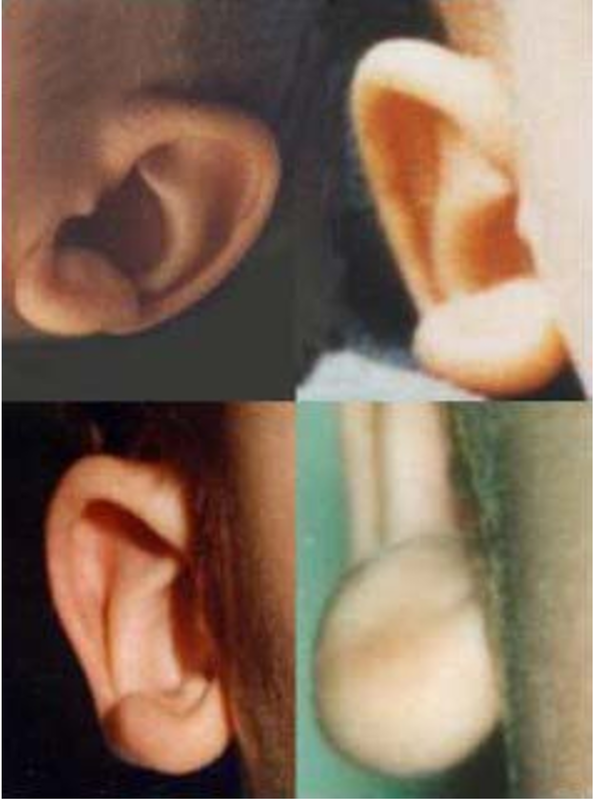 Below: Uplifted earlobes in people with Mowat-Wilson syndrome (5).